Most car enthusiasts need an organized place to store their tools. The garage is the likeliest choice to store tools to work on cars. Having a storage solution that will fit the storage space, is mobile, and will fit tools would prove a usable storage solution, especially when it makes finding tools easy. Moduline Cabinets are built to last, made from high-alloy aluminum. All of our cabinets are American-made products that display beautifully and are equally functional. We’ve created our aluminum cabinet systems to be innovative to fit the environment they’re in. Moduline Cabinets recently announced new sizes available for Mobile Tool Boxes. We have a variety of sizes and layouts to choose from, or can customize the layout for your needs. Our standard sizes come in 32”, 48”, and 60” width. The Mobile Tool Boxes are crafted from lightweight aluminum and feature the QuikDraw® latch system, stainless steel countertops, locking casters, drawer liners, and locks for security. They help create a functional garage to work on cars when you can move the tool box to your working station. 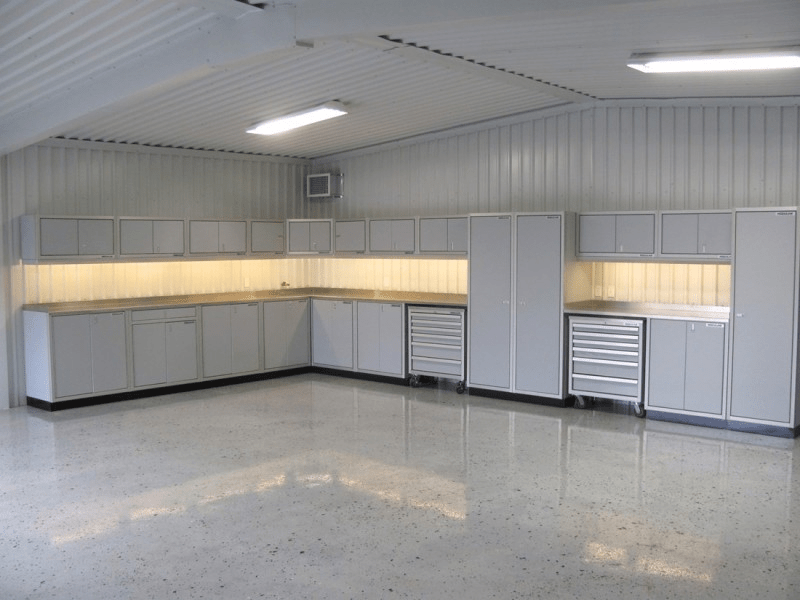 To get started with your garage organization layout, one of the first things we recommend to do is to consider how you’re going to use the space. No matter the size of the space, we have a pre-configured cabinet combination that will fit. We can also customize a layout to suit your needs. The next step is to measure the space. It’s important to pay attention to the space where the windows and doors are located in the garage, as these will be important to work around for your layout options. You’ll want to consider whether you’re installing the cabinets against a wall, and whether you’ll need overhead cabinets. We recommend browsing online in our store or catalog to see all of the layout options we have available. You might see combinations you want to have in your garage space. When you’re ready, give our Cabinet Specialists a call to discuss your space, layout needs, and project by calling us at 888-343-4463.